I've gone purple! I've seen the lavender hair trend for a while now, and figure the time is now, while I'm still a student and don't have an office job to worry about! Throughout the process, I documented each stage with lots of pictures. So, if you want to know how I went from black/brown hair to lavender, and how you can do the same without visiting a salon, keep reading! Let me give some background on my hair first. I started with my natural color, which is a black/brown. My hair has never been dyed (except for a little semi-permanent purple on my bottom layer that lasted only about 2 weeks, and that was 2 years ago). I don't usually straighten or curl it, I do blow dry each night though. I wash my hair each night because it's very fine and oily. It's normally healthy, this is basically the first time it's being put under any major stress. I'm not a hair person, and the pros might tell you it's a bad idea to try to do something like this by yourself at home. Armed with watching too many YouTube videos on bleaching and coloring hair, I decided to take the plunge anyway. My mom did most of the work, I'd advise you get a friend or family member who you trust to do the actual bleaching and dyeing. As mentioned, quantities will vary depending on your hair (thickness/color) and you can always ask the ladies at Sally's for help! Now let's get on to the process! I'm going to start by running a generous amount of coconut oil in my hair before bleaching. This helps protect the hair. Empty the two bleach packets and creme developer into the mixing bowl. It should be a ratio of 1 part bleach to 2 parts developer. Mix it up and then have your trusted bleaching buddy put on some gloves and get ready to go! Divide hair into layers and hold it with a clip. Take the color brush and start brushing the bleach evenly onto hair until it's completely covered. After your whole head is covered, clip up your hair and wait 40 minutes. When the 40 minutes is over, rinse your hair. I used a deep conditioning hair mask to revive my hair a bit then rinsed again. My hair lightened to this color, it was like an uneven yellow-orange-brown sort of deal. But, that's okay because it's only the first of 2 bleachings! These were my in between days where I gave my hair some time to relax. Each night, I deep conditioned with Aussie's 3-minute miracle, used my Moroccan Oil Styling Cream and Oil for moisturization, and then coconut oil. My hair actually felt okay, it was drier at the ends but didn't feel as damaged as I usually hear people say. Back for bleaching round 2! I repeated the same process from the first time to pale my hair even more. After rinsing the bleach out, I used Shimmer Lights Shampoo to get rid of as much brassiness as I could by massaging it in and leaving it for 5 minutes. Then, I used Shimmer Lights Conditioner and left that in for 5 minutes too before rinsing. Next, I let my hair air dry. Then, I used 2/3 the jar of Manic Panic's Virgin Snow hair toner to get more of the dark yellow out. I left it on for 1 hour before rinsing. When I woke up the next morning, I used the remaining 1/3 of the Virgin Snow toner because I figure I might as well, what else am I going to do with the stuff. Above is the result. My hair is still uneven, but I got it to as pale as my hair is going to go! Late afternoon, my friends were over and we got started on the purple! Sectioning the hair into layers, my friend and sister helped to cover my hair using the brush and their fingers. About half way, we realized there wasn't enough dye! The lavender dye tubes are not very big... and although I thought 2 would be enough, it was far from. So, we finished what we could and left it at that. That night, I used the Shimmer Lights Shampoo and Conditioner again, and between that and the purple dye partially in my hair, my hair got to an icy blond/purple! You can see the splotchy blond/lavender I stopped at here! After buying another 2 boxes of dye from Sally's, I was ready to finish my hair journey! Above I put one of my lipsticks next to the tube of dye just to reference it's size. My hair is thin, but also long and dense. I needed a total of 4 tubes of dye. This is the amount of product one tube holds (not very much). Here's the finished product! I don't think I've ever loved my hair more! It's worth noting thought that the dye did irritate my scalp a bit and I was itchy for a couple of days. It could have been my own fault, maybe I rubbed it into my scalp (you only want to brush the dye on your roots, not massage it into your head) or something. They tell you to do a patch test first, which in hindsight would have been smart to do. May I say that the purple hair goes great with bright red and orange lipsticks! I'll definitely be wearing them more often! If you're like me and new to bleaching and dying, I would recommend watching some YouTube videos (tashaleelyn is very helpful), talking to people who know a thing or two about hair (thank you to my two friends who are in the process of becoming hair dressers) and finding someone to help you! I'm sure after everything was bought this was still cheaper than going to a salon, and I'm just as happy! 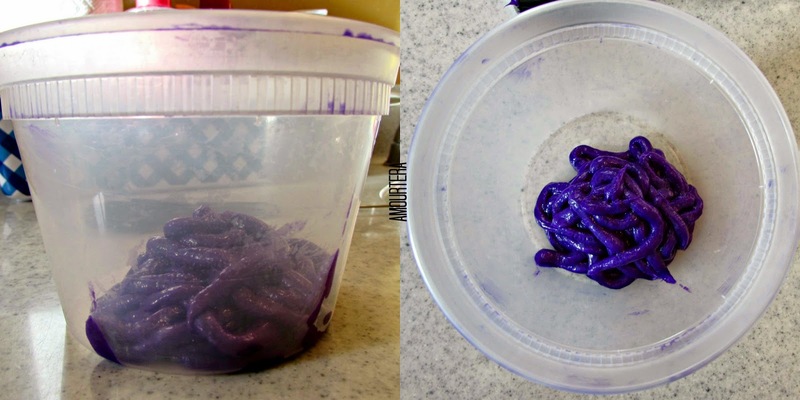 Last night, I washed my hair for the second time since going purple and while shampooing, I did notice a lot of purple going down the shower drain :( I recommend using a sulfate free shampoo and wash hair every other day to keep the color longer. Add some dye into your conditioner each time you wash, and use dry shampoo on the days you don't wash. I do see some blond again (mainly in my side bangs, I can always touch them up)... I'm disappointed because it's only the second washing! I guess I'll go a little heavier with the purple over those areas with blond showing. Don't get me wrong though, 95% of the purple is intact! If anyone has questions, don't hesitate in the comments below!